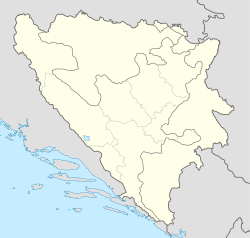 Location of Tešanj within Bosnia and Herzegovina. Tešanj is a town and municipality located in Zenica-Doboj Canton of the Federation of Bosnia and Herzegovina, an entity of Bosnia and Herzegovina. As of 2013, it has a population of 43,063 inhabitants. It is situated in the northern part of Bosnia and Herzegovina. Tešanj is located at an altitude of 230 meters and developed around the river Tešanjka. The present name of the city was mentioned for the first time in 1461 in a charter from King Stephen Tomašević to his uncle Radivoj. The charter stated that King Stephen Tomašević grants him, among other possessions "i na Usori grad Tešanj -- the city of Tešanj, in the Usora region". Between the second half of the 15th century and the first half of the 16th century, the history of Tešanj was rather chaotic. Since Bosnia was considered a buffer state by the Ottomans, it changed rulers quite often, alternating between Ottoman and Hungarian occupation. Between 1463 and 1476 Tešanj was the center of the Bosnian kingdom and the residence of Duke Radivoj Kotromanić. A room inside the Tešanj Castle. From 1512 (or 1520-21) on, Tešanj was under continuous rule of the Ottoman Empire. The most Ottoman influential ruler of Tešanj was the Bosnian Sandžak-bey Gazi Ferhad-bey. It was under his authority that the city rapidly developed. His most significant contribution was the Ferhadija Mosque (1563), which still stands in the old town, dating back to the 16th century. Gazi Ferhad-bey died in 1568 and was buried in the yard of the mosque. The epitaph on his tombstone was in Arabic, and is the oldest Islamic record in Tešanj. The old Eminagić House is the oldest house in Tešanj, still standing the test of time, and is said to have been built at the end of the 17th century. The Old Town is dominated by the well-preserved fortress, called "Gradina", that overlooks the entire city. The Upper City Center expands around the castle, rather on the bottom of this castle. Very early this castle became a center of economic and cultural life of Tešanj. This was developed along with retail and trade in Tešanj. The city center developed rapidly in the 17th and 18th century, when there were around 40 stores and trades operating. The hour tower was built in the 17th century. Out of a total of 21 hour towers that were built throughout Bosnia and Herzegovina, this tower is one of four that are still working properly. It is 18.5 meters tall. Up until 1890 this tower showed alaturk time, but the same year Fehim-beg Smailbegović brought a new clock which showed European time. This hour clock is still working. The grave of the poet Musa Ćazim Ćatić is located in "Obješenica" cemetery in the city center. Even though he was born in Odžak in 1880, he dedicated his whole life and work to the city Tešanj, where he died in 1915. From 1929 to 1941, Tešanj was part of the Vrbas Banovina of the Kingdom of Yugoslavia. The foundation of this fortification was started even before the Romans conquered the region. Exact dates are unknown. It was later enhanced by the Romans, Slavs and the Ottoman forces. It has been primarily a defensive fortification. Tešanj Castle is one of the most significant and biggest castles in Bosnia, with the area of some 6,296 square metres. During the Ottoman period, the castle had a permanent army. The town of Tešanj itself had 5,253 residents in 1981, and 6,058 in 1991. Note Muslims are Bosniaks. Wikimedia Commons has media related to Tešanj. This page was last edited on 24 March 2019, at 18:44 (UTC).